After the 3 hour drive from brantford to detroit...and beng held up by customs for another 45 minutes...I was standing in line for my first silverchair show...in the states...although Detroit has the same funky smells as Toronto does, I still wasn't about to walk anywhere alone out of fear of being shot. After geting into the histroic St. Andrews Hall I grabed a shirt because they were cheaper in Detroit then they were at the Toronto show and headed up the stairs to the balcony for what would be another amazing night...once again We Are The Fury got the night started...the crowed seemed to be into them alot more then the toronto show...maybe because they're from Toldeo Ohio which isn't very far from Detroit. After they finshed up it was that time time of the night again...the lights dimmed...the beating heart played over the speakers and the boys came out. Once again tonight Ana's Song was on of the stand out songs...the way Daniel starts it of so slow...so emotional and builds the song up until Ben and Chris join in, is simply beautiful. Insomia was another song that sytood out tonight...seeing it live is pretty amazing. Once Daniel grabbed his trusty SG I knew it was times for some stright lines, which was preformed almost flawlessly...this is the only song of the night where Daniels laryingitis seemed to bother him, and it was barly noticible...now it was time for the famous stroll down memory lane as the famous green PRS was handed to him by trusty guitar tech bailey, it was time to rock and roll...and the ripped through the open notes of the door the crowd started to go insane. At some point during the set a hat was tossed onto the stage and Daniel wasted no time putting it on and claiming he was "justin Timberlake...the set ended with scoarhing version of mind reader and the boys left again to shout of silverchair...I used this time to grab a quick bathroom break. As the boys came back on stage they wasted no time in pumping out "If You Keep Lossing Sleep" and then came "Freak" singalongs and all...asd the band left the stage the crowd buzzed and was screaming for a 2nd encore for about 15 minutes...and didn't stop until the drum kit started to be taken apart...between this show and the show in toronto I'm pretty sure I was at the 2 best shows on the tour...and if it wasn't for work obligations i woulda been on my way to chicago for Lallapollza the following night...I hope i'm not waiting 4 years for the boys to come back again....although i made up for the 4 years by attending 4 shows this year...i'll never be able to get enough chair. We drove more than 3 hours from Ohio to see my favorite band for the past 12 years. This was my sixth time seeing them live, but it was 1999 since the last time I had seen them and I knew I was in for a new experience. The concert was amazing and the new songs sounded incredible live. However, I was disappointed they didn’t play Those Thieving Birds/Strange Behavior. Daniel messed up during Reflections of a Sound, and Ben was cracking up…Daniel apologized to the band after the song and they all laughed. Actually it seemed like Daniel was feeling the music so much he just kind of spaced out. Daniel was pretty mellow during the show, not talking much. Before playing The Door, he mentioned something about it dated back to 1925 and that “this is not a song about mammals”. Chris had a little bass solo in The Door, which was a nice touch. Go Chris! Highlights of the show included Emotion Sickness. The whole crowd was feeling it and Daniel let us sing “Get up…Get up…” He seemed amazed that everyone was belting it out. The band lengthened the instrumental in the middle and it was amazing. Daniel did a bit of acoustic in the beginning of Ana’s Song, which was incredible. Another highlight was Without You, it was powerful and heartfelt live. My favorite album is Diorama, and I was really disappointed I didn’t hear more from it (esp. Tuna in the Brine, The Lever, Luv Your Life). Daniel did his usual playing solos with his teeth, which was really cool. Even though the boys are much older, they still had that same goofy chemistry on stage – laughing with each other, winking and being silly. It was great to see them all smiling and being silverchair again. The crowd was amazing – it was so great to still see so many fans supporting the band. Daniel also commented that this show was tied with Portland as the best so far on the tour. All in all it was an amazing show – but I wish they would have played a few more songs. It was over way too quickly. I hope they come back to states soon and play more dates… especially in Ohio! For the past few days I've been reflecting on the show which I waited eight years to see, and I still feel inspired from it. My group of friends and I officially started the line for the show at 5am. We drove 6 hours to get there, but I've waited 8 years to see them.. so I figured what is one day of waiting in line. Let me just say.. they made it worth it. On that night they made Detroit "Rock City" live up to its name. I've been to hundreds of shows over the past few years and I can honestly say that this was the best show I've ever seen. I never imagined I would be lucky enough to see this band but I was fortunate enough to see them a venue that only held 818 people, and to be front row. Without any of the special effects and massive light shows other bands seem to rely on - Silverchair managed to pull off an energetic and emotional performance that never failed to keep me clapping and singing along with an enthusiasm I may have never experienced before those moments. From the opener, Young Modern Station, through the closer, Freak, I felt inspired and honored to be in the presence of such greatness. Daniel's voice and stage presence was amazing, and it was so great to finally hear him in person. 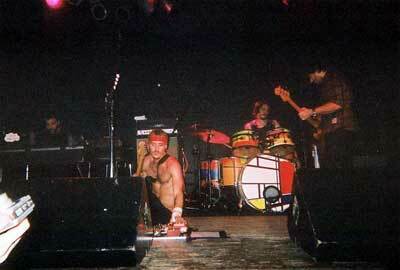 The music was extremely tight, even moments when they would let themselves go and jam they were incredibly solid. One of my favorite moments was during Emotion Sickness, which is such a good song, but the live version is beyond words. Daniel fell to his knees during the "get up" part, and the crowd immediately started shouting the words as he made his guitar squeal and twirl with various effects. I love the way they change all of the songs a bit for the live show. It seemed to go by so fast, as all good things tend to do. I truly hope this band continues to make records and that I have a chance to see them many times in the future. 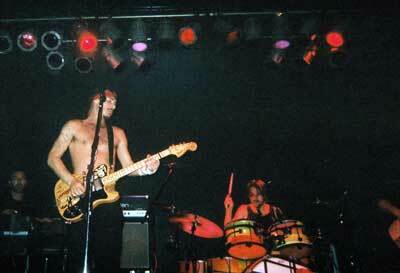 Silverchair is back in North America! What a dream come true. St. Andrew's was a perfect venue in downtown Detroit, lots of history and character. A very cool setting. I took my cousin Rob who is off to university in the fall. We took the tunnel over from Windsor. We really got pumped when we turned the corner and saw Paul Mac right outside the Marriot Hotel at the Renaissance Center about an hour and a half before the show. It's great to have him on tour and everyone knows Dan's ecstatic. Mid show he says something like "does everyone know my best friend Paul Mac?" and the crowd cheers. I love the whole positive vibe starting with Diorama. I grew up watching this band evolve and loved every minute of it. My cousin is a brand new Chair fan; he just started listening when he learned he was coming to the concert. He was so happy they played "Straight Lines." Says it's his new favorite song. During the song Dan says "make me feel famous" and steps away from the mic indicating he wants to be serenaded by the crowd with the chorus "wakin up strong in the mornin, walkin in a straight line, lately I'm a desperate believer, but walkin in a striaight line" It was a really powerful sound. "Set me on fire in the evening, everything will be fine." They made "Freak" their finale. It seemed so fitting that some might question it was staged when a fan threw this really slick black Fedora hat up on sage between "If You Keep Losing Sleep" and "Freak" and Dan walked over, picked it up, and put in on for the closer. This show was real different from the one I attended in Toronto (at this dance hall called The Government) after Dan had recovered from the arthritis. I remember it like yesterday; they opened with "Steam Will Rise." The crowd was a lot younger and rowdier back then. Both were amazing concerts. Here's an example of one really cool difference I noted ---- now they're playing new Silverchair on the radio! I hope they hit it big AGAIN here, and I'm glad I didn't have to "swim to Australia" to see them again. I could say so much more, but I know I gotta keep it short. Here's the set list. I believe it's in the correct order, but I'm not for certain because it was from memory. All the songs were superb! Silverchair fan from start to finish.